a spell of sparkling snow! to the portals of polar Mysteries. to be here among us! 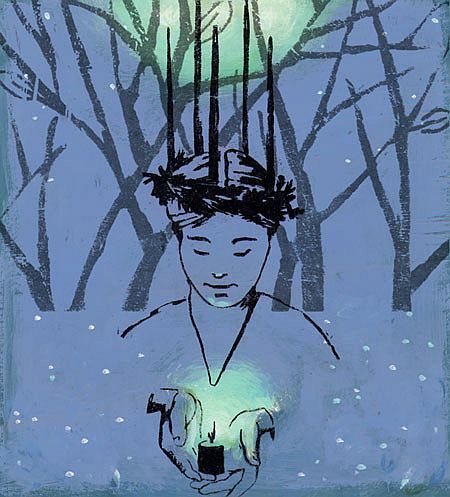 The Winter Solstice is a magical season . . . one that marks the journey from this year to the next, journeys of the spirit from one world to the next, and the magic of birth, death, and rebirth. The longest night of the year (December 21 in the Northern hemisphere) is reborn as the start of the solar year and accompanied by festivals of light to mark the rebirth of the Sun. 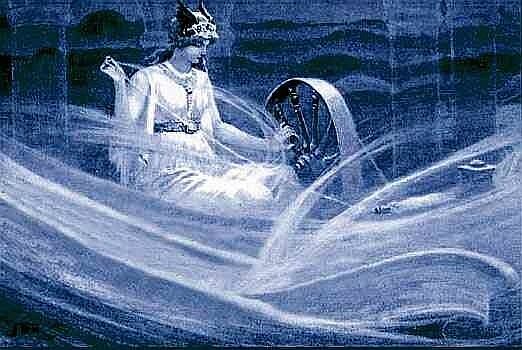 In ancient Europe, this night of darkness grew from the myths of the Norse goddess Frigga (also known as Freya) who sat at her spinning wheel weaving the fates, and the celebration was called Yule, from the Norse word Jul, meaning wheel. The Christmas wreath, a symbol adapted from Frigga’s "Wheel of Fate", reminds us of the cycle of the seasons and the continuity of life. 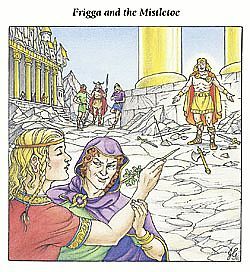 Frigga/Freya was the goddess of beauty, love, and marriage. 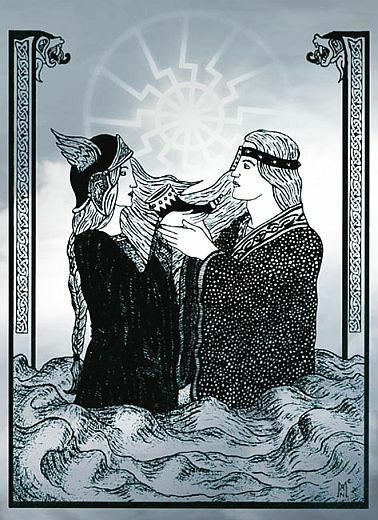 Wife of the powerful Norse god Odin, Frigga/Freya was a sky goddess, responsible for weaving the clouds, and therefore responsible for rain and for thunderstorms. 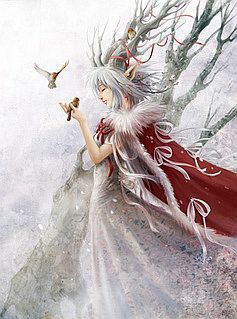 Her sacred animal was the goose, and in her Germanic incarnation as the goddess Holda or Bertha, she was the original Mother Goose (causing it to snow when she shook out her bedding). Sitting at her spinning wheel weaving the fates, she was also a goddess of divination and credited with the creation of runes (though other stories give their creation to Odin)...more precisely she was a 'seer', one who knew the future but could never change it or reveal it to others. 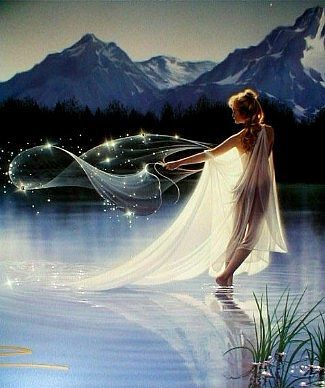 In Northern Europe, the year's longest night is called "Mother Night" for it was in darkness the goddess Frigga/Freya labored to bring the Light to birth once more. 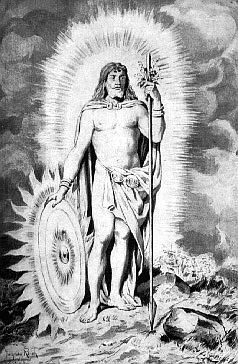 The Young Sun, Baldur, who controlled the sun and rain and brings fruitfulness to the fields, was born. Frigga's blessing is invoked for all birthing women, and a white candle that last burned on the solstice is a charm to provide a safe delivery. Being a seer, she foresaw her son Baldur’s death. Knowing that there was nothing she could do to avert his fate, the hapless goddess extracted a promise from all things that they would play no part in his death. Unfortunately, thinking the mistletoe was too insignificant to bother with, she neglected to secure its pledge. And when the malevolent prankster Loki discovered her oversight, he crafted a dart made of the poisonous plant. Devious and evil, he brought it to Baldur's brother who was blind, suggesting a game of darts and agreeing to guide his hand. And this he did, directing the dart directly at Baldur's heart. The plant's white berries were formed from Frigga’s tears of mourning when her beloved son Baldur was killed Some versions of the story of Baldur’s death end happily. Baldur is restored to life, and the goddess is so grateful that she reverses the reputation of the baleful plant, making it a symbol of peace and love and promising a kiss to all who pass under it. Mistletoe is also thought to be the "golden bough" of Virgil's Aenid, a plant that once offended the gods and was cursed to have to look on while beautiful girls were being kissed. In Rome mistletoe played a role in the Saturnalia, festivals held during the Yule season to celebrate the birth of Saturn. 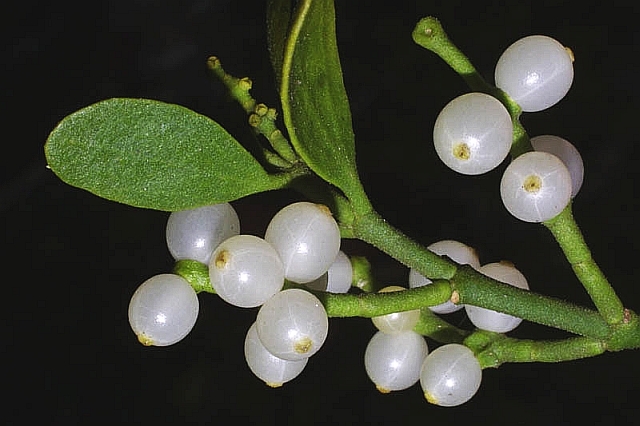 The tradition of kissing under the mistletoe (and removing one berry with each kiss until none remained) emerged from that fertility rite. This may explain why, unlike other pagan traditions, banning the plant from churches is still widely practiced even today. The Druids (British) also revered the plant's powers as an aphrodisiac, believing the berries to contain the sperm of the gods. On the sixth night of the new moon of the winter solstice, they would use a golden sickle to cut the mistletoe from the sacred oak, letting it fall into a cloth held under the tree by members of the order so that the sacred plant would not touch the ground. The Chief Druid would cut off sprigs for distribution to the people, who hung them over their doorways for protection against thunder and lightning. That the timing of the Christian celebration of the birth of Christ occurs in the Yule season is no coincidence. Christmas was once a movable feast, celebrated many different times during the year. The decision to establish December 25 as the "official" date of Christ's birth was made by Pope Julius I in the fourth century AD, hoping to replace the pagan celebration with the Christian one, since this date coincided with the pagan celebrations of Winter Solstice with the Return of the Sun Gods occurring throughout the world. Numerous Christmas traditions derive from the earlier pagan celebrations. 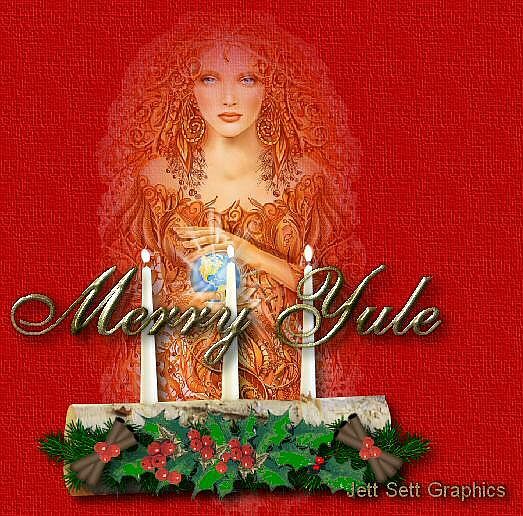 Yule, celebrating the birth or rebirth of a god of light, made use of fire, both in candles and the burning of a Yule log. The Christmas tree has its origins in the practice of bringing a live tree into the home so the wood spirits would have a place to keep warm during the cold winter months. Bells were hung in the limbs so you could tell when an appreciative spirit was present. Food and treats were hung on the branches for the spirits to eat and a five-pointed star, the pentagram, symbol of the five elements, was placed atop the tree. 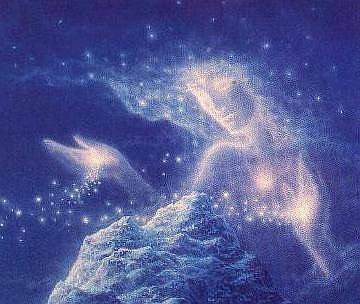 Throughout the world gods and goddesses of light were being born during the Winter Solstice. The Egyptian goddess Isis delivered Horus whose symbol was the winged Sun. Mithras, the Unconquered Sun of Persia, was born during the solstice, as was Ameratsu, the Japanese Goddess of the Sun. Rhea gave birth to Saturn (the Father of Time), Hera conceives Hephaestus, and Qetzalcoatl, Lucina ("Little Light") also celebrate birthdays at this time. Lucia, saint or Goddess of Light, is honored from Italy to Sweden, crowned with candles to carry us through the darkness. Sarasvati, Queen of Heaven in India, is honored during Yuletide. The Solstice is also a time of plenty. The Hopi Kachinas return to the Earth during the solstice, and the Deer Mothers dance for the fertility of the earth. The hearth fires of Hestia (known as the Roman goddess Vesta) are quenched and then rekindled. The "first fruits" festival, Kwanzaa, is held to honor the seven major deities of Yoruba. As we move toward the cold darkness of winter, we enter the dark Goddess Skadi’s realm. 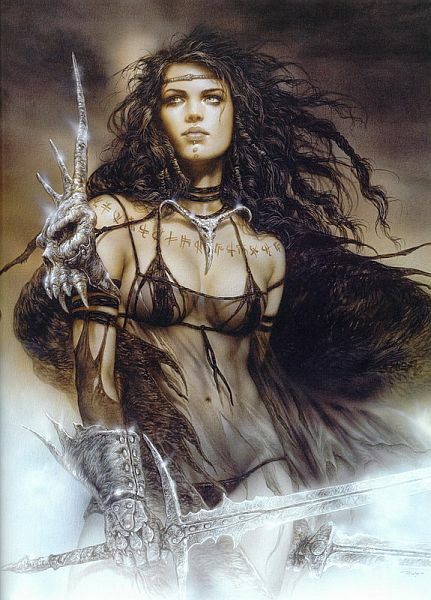 Skadi (sometimes spelled Skathi) is the Viking Goddess of winter. Her name is said to mean shadow or shade. She is the Queen of the shades. She is a huntress, a dark magician, a giantess Goddess, ruling especially over mountains, wilderness, winter, revenge, knowledge, damage, justice, and independence. It is said that she gifted hunters with the bow and the skill to use it. The scythe, wolves and venomous snakes are sacred to her. Also sacred to her are skates, skis and snowshoes. She often did her hunting while on skis. 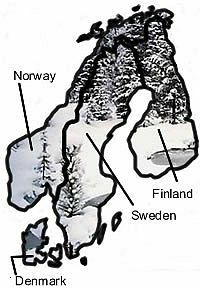 All of Scandinavia is named after the Goddess Skadi, and she is said to dwell in the high snow-covered mountains there. Skadi is the daughter of the giant Thiazi. 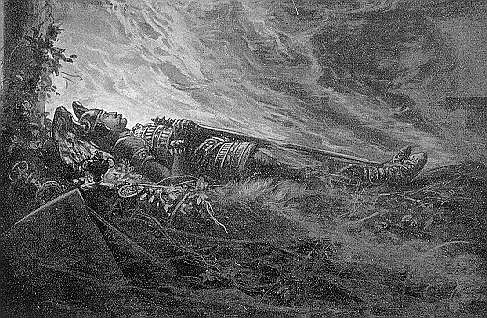 In one of her myths, her father Thiazi kidnapped the Goddess of youth, and then was killed by the Aesir who came to rescue the Youth Goddess. Skadi then went after the Aesir to get revenge for the death of her father. After they married there was some debate about whether they would live in his realm or hers. They decided to live nine days in her mountains and then nine days in his sea. After the eighteen days, the couple separated because they did not like each other’s domain. he wakes me who comes from the sea every morning, that gull." 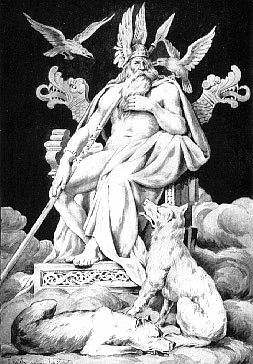 After their separation, Skadi had several sons with the god Odin. Skadi also has close ties with the trickster god Loki. As part of her agreement with the Aesir, they not only allowed her to choose the god of her choice for a husband, but they also promised to make her laugh, since she had not laughed since her father’s death. This task was given to Loki. In an effort to make her laugh, Loki tied one end of a rope to the beard of a goat, and the other end of the rope to his own testicles. As the goat tried to get away, both Loki and the goat shrieked in pain, and this did make Skadi laugh. It is said that Loki then fell onto Skadi’s lap bleeding, and his blood fertilized her. When Loki killed or aided in the killing of the God Balder, Skadi was sent to punish him. 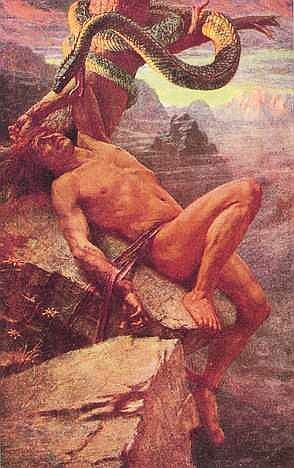 He was bound to a rock by Thor, and Skadi then placed a poisonous snake on his head. The venom of the snake slowly dripped down upon Loki’s face, forever burning and torturing him. 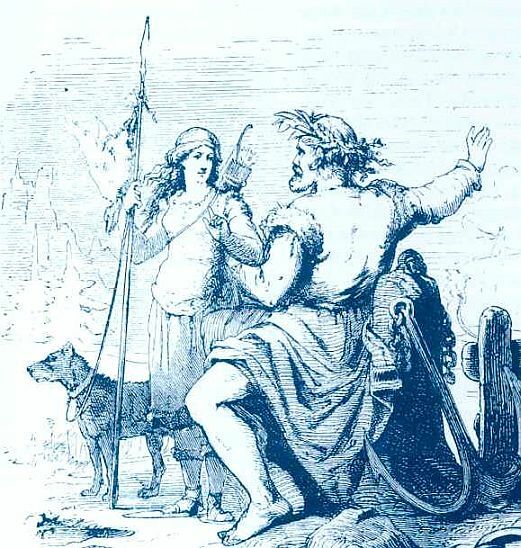 In some of the more negative tales of Skadi, she was named Mornir, the troll woman, and was said to have castrated and then collected the penises of heroes. It is said that offerings of men’s blood were made to Skadi, symbolizing the blood of Loki that had fertilized her. Priestesses of Skadi were said to have bathed in blood as preparation for their rituals. Skadi is not an evil Goddess; she symbolizes the many dark times that we all go through. 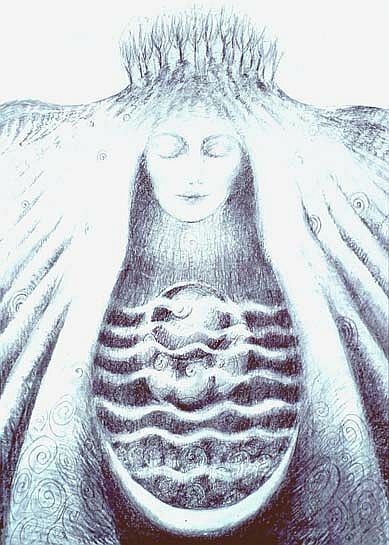 She also symbolizes the primordial womb. Without the dark there is no light. From information obtained from folklore sources Motz established that the folk figures of Holda, Holle, Bertha and Percht/Perchta originated from the divine female guardians of nature and animals found among the ancient hunting culture. This primitive image developed into the complex female deity known in early civilisations as - The Lady of the Beasts -. This folk figure of Holda/Perchta had many local manifestations, but one basic form with definite characteristics can be recognised. In a Christian culture, where paganism was supposed to have been eradicated, this form was still given divine status by the common people. In fact it was worshipped within a ritualistic structure that included sacrificial offerings and the wearing of ritual animal disguises in seasonal celebrations. The Roman Catholic Church recognised the existence of this goddess figure and feared her popularity among the peasantry. In the 13th Century one clerical text complained that young people would rather pray to Perchta than offer prayers to the Virgin Mary. Two hundred years later, just before the beginning of the witch hunts, the Church was still condemning sinners who left food out for Perchta during the Christmas period to ensure good luck and prosperity for the coming year. These offerings were placed on the roof of houses in Germany, Switzerland, and Austria and are an indication that Holda/Perchta was regarded as the female leader of the Wild Hunt. In Central European folk culture the Hunt was mimicked by men wearing black fur cloaks and terrifying masks who ran through the streets ringing bells, brandishing whips and shouting. Holda's physical appearance reflected her position as both a bright and dark goddess figure. She might appear as a beautiful young girl, veiled, crowned or clothed in a shining white dress. On other occasions she was seen as a hunchbacked, wizened old crone with long tangled grey hair, a beaked nose, wolf fangs and glowing red eyes. 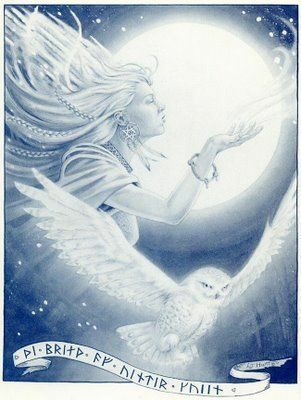 As the White Lady, Holda was invoked to increase fertility of the fields and to bring prosperity to home and family. If she was insulted however or ignored then she became the Old Hag or Crone whose gifts were misfortune, illness and death. 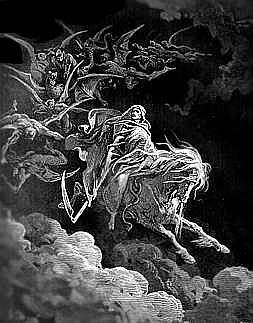 In this form she was responsible for the snow and fog, and is a typical dark goddess of death, the underworld and winter. As a deity who originated with the ancient - Lady of the Beasts - Holda had many totem animals. They included wolves, hounds, pigs, goats, horses, bears and birds of prey. 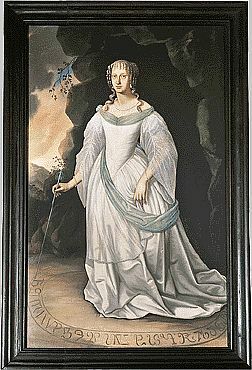 She was also associated with the wildwood and, while seldom linked to male figures - she is represented as an uninhibited patron of orgiastic sexuality - in the Southern Tyrol she appears as the wife of the arboreal - Wood Man. 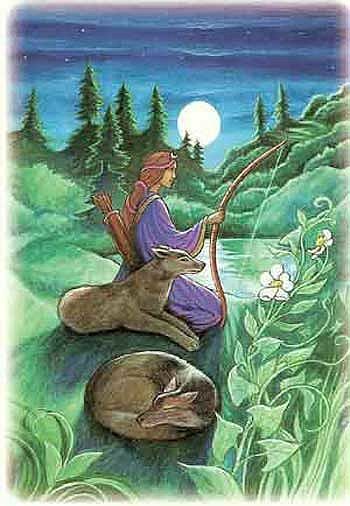 In common with this male forest spirit/god, Holda was the protector and guardian of woodland animals. Another indication that Holda was regarded as the goddess of death and destiny is her association with spinning. She was the patroness of women who were spinners and weavers (and of spinsters) and she punished those who failed at this craft or produced shoddy work. Those who did not pay her respect while carrying out the craft could be struck blind or Holda would materialise and beat them with a whip. During the twelve days of Yule all spinning ceased in her honour and bad luck came to anyone who defied this custom. Holda's attitude to children, who also come under her protection, was also ambivalent. If they behaved themselves during the year then at Christmas she rewarded them with gifts and good luck. If they had been naughty they would be severely punished. Sometimes Holda was used as a bogey figure and mothers threatened their children that if they did not behave then she would come and take them off to the woods and teach them good manners. Holda allegedly kept the children in a well, endowing the good ones with abundant luck, health and wealth, and turning the bad ones into Faery changelings. It is not fanciful to see folk memories of Holda in popular fairy tales. Stories of faery godmothers, wicked stepmothers with spinning wheels and old witches living in gingerbread cottages in woods spring to mind. Snow White, Sleeping Beauty, Hansel and Gretel and Little Red Riding Hood all have elements that could be derived from folk tales about Holda. The Grand Dame of fairy tales, Old Mother Goose, is another version of Holda. In 18th and 19th century bowdlerisation of fairy tales Old Mother Goose, degenerated into a comic figure, a foolish old woman who told old wives tales. Originally she was the wise Sibyl who instilled moral values, the knowledge of the world, foresaw the future and prepared her charges for it. (See Marina Warner's From the Beast to the Blonde - Chatto and Windus 1994). Eventually Mother Goose became the stereotyped witch with her conical hat, pointy nose, lantern, jaw and stick. The Sibyl/wisewoman had become the wicked stepmother - the alter ego of the faery godmother or gossip who protected and blessed the new born. Holda's connection with witchcraft is mentioned in several historical accounts. Church records quoted by Motz as late as the 15th Century describe women who rode with Hold/Perchta. In 1630 an allegedly male witch in Hesse, Germany confessed he had ridden with Dame Holda on New Year's Day and had followed her into the sacred mountain of the Venusberg. A 16th Century woman from Bern was exiled after she admitted riding with the Wild Hunt led by Holda. In common parlance to ride with Holle meant to be dishevelled, to be an unkempt hag or to ride with witches. This was a reference to the long flowing hair of the goddess which was also regarded as a physical characteristic of suspected witches of both sexes, and was regarded as of magickal significance. The evidence provided by Motz offers considerable proof that goddess worship survives into the early modern period and beyond. These beliefs still survive in seasonal customs enacted at the summer and winter solstices. In a lesser way it also links with the connections between werewolves and witches. In Germany, for instance, December was known as the month of the wolf or wolf moon. The wolf was one of Holda's sacred beasts. Motz says that because the Church identified Holda with Diana some historians have assumed the cult of this Southern European moon goddess of hunting was imported into Austria and Germany by the Romans. Motz however, believes that the hunter goddess image arose independently in these areas, although it was influenced by beliefs from the North. Motz concludes that Holda has the common feature of the Mistress of the Wild Things symbolised by Diana/Artemis, - who represents . . . the force of nature which is both life giving and life taking -. She is therefore the archetypal witch goddess. And I climb upon the Raven Mountain and yell. So I invocate: Eaaaaaaa! Winter rise!.. Soon red morning will born and white is the sky above us. Tradition varies about the type of wood to be used. Oak logs were popular in the north of England, birch in Scotland and ash in Cornwall and Devon. Ash is the only wood that burns freely when green and the world-tree, Yggdrasil, in the Nordic tradition was an ash-tree. It is important that the Yule log be the biggest and greenest log available since the Christmas festivities will last only as long as the Yule log burns. In some parts of the Scottish highlands, the head of the household finds a withered stump and carves it into the likeness of an old woman, the Cailleach Nollaich or Christmas Old Wife, a sinister being representing the evils of winter and death. She's the goddess of winter, the hag of night, the old one who brings death. Burning her drives away the winter and protects the occupants of the household from death. 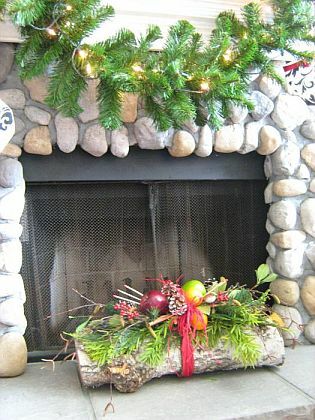 The Yule log is left to burn all night, and, if possible, through the next twelve without going out, although it may be extinguished with water. The ashes are kept for good luck. They have magical properties and can be scattered in the field to fertilize the soil or sprinkled around the house for protection. 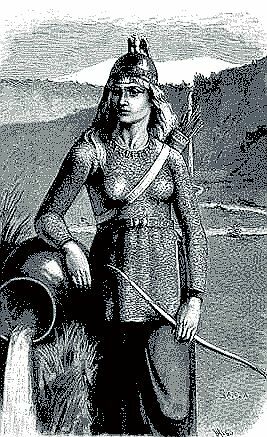 In many Norse Heathen traditions, November 9 is the day to honor the great Queen Reina Sigrith of Sweden. The legend goes that the Norwegian king, Olaf the Lawbreaker, asked Sigrith to marry him. The queen said yes, but then the Christian Olaf asked her to give up the gods of her ancestors. Sigrith declined, refusing to abandon her faith or that of her kinsmen who came before her. Olaf had a hissy fit and cancelled the wedding, and the Swedish people retained their Heathen faith for another three centuries. 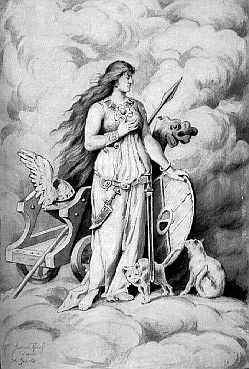 Today, many Asatru mark November 9 as a day of celebrating Sigrith, defender of the ancient ways. Winter Solstice is celebrated as the feast of the Baltic goddess Saule in Latvia and Lithuania. The Great Goddess, Saule, (pronounced SOW-lay) whose name means the sun itself, is queen of heaven and Earth and matriarch of the cosmos. She is a beloved and popular deity of the Lithuanians and Latvians, as many old hymns and prayers attest. Her main feasts occur at the summer solstice (Rasa or Kupolines), winter solstice (Kaledos) and the equinoxes. As the days grow shorter in the fall season, Saule weakens in Her battle against the powers of darkness. Many rituals and spells are undertaken to aid and strengthen Her at that time. Lithuanians begin awaiting "The return of the Sun" around November 30th. Closer to the end of December, festivities in Her honour begin and last until the 6th of January. This period of awaiting Saule's return, became the Christian Advent in later times and Kaledos is now synonymous with Christmas. Saule is often portrayed as a golden-haired woman, richly dressed in golden silk raiment with a golden shawl and crown. 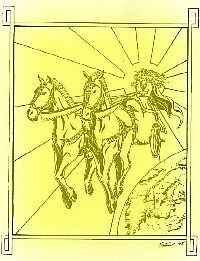 She drives her chariot across the heavens, pulled by two white, golden-maned steeds, called the "Asviniai" or the Divine Twin Sons of Dievas (God of Shining Sky). Saule has close associations with the sea, into which She sinks at the end of her daily journey to bathe and wash her steeds and then crosses by boat. By night, She travels through the underworld, shining in Her dark aspect. As the female head of the heavenly family, Saule is the mother of the planets. Among Her daughters are: Vaivora (Mercury), Ausrine, (Morning Star or Venus), Zemyna (Earth), Ziezdre (Mars), Selija (Saturn) and Indraja (Jupiter). Thus, according to some scholars, Lithuanians named the planets during a matriarchal age. i.e. earlier than the Romans. On December 13th, (Feast of St. Lucia), Saule pauses on Her return to dance with Her daughters. She also dances at Velykos (Easter) and Rasa (summer solstice). Saule was married to Menulis (the Moon), but divorced Him due to His infidelity with their daughter, Ausrine (the Dawn). Saule scarred His face for this deed. In other versions, Dievas smote the handsome Menulis and disfigured Him. 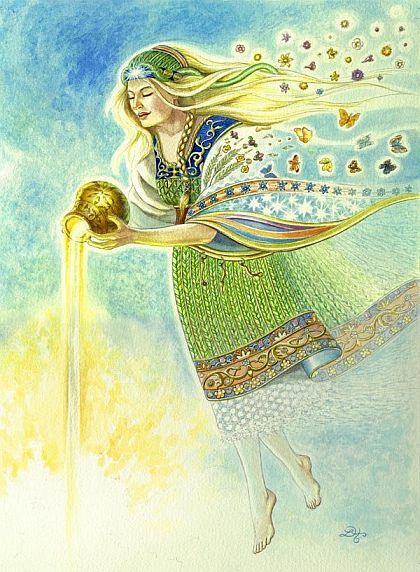 The Sun Goddess is associated with the magical Smith God, Kalvis (comparatives in Latvian - Dangaus Kalvis and Finnish - Ilmarinen.) It is said that He created the Sun and placed Her in the heavens. Other mythologies include tales of Her imprisonment and rescue by a hero or the signs of the zodiac. Saule is wealthy, but works hard to care for Her lands, fields, cattle and family. Unlike the fickle Menulis, who occasionally disappears for a few days, Saule always rises and attends to Her duties. In a sense, "Her work is never done." She loves all people and shines on all equally and unconditionally. Her love for humanity is likened to that of a mother. Good women are often compared to Her. In Saule's presence, demons and wicked spirits flee and people feel safe to go about their businesses and tasks. But, once She leaves the skies, certain work must end. To continue, without Her guardianship, would be inviting trouble from dangerous spirits. Within Saule's garden, situated in the west, are apple trees bearing their fruit of gold, silver and diamond. 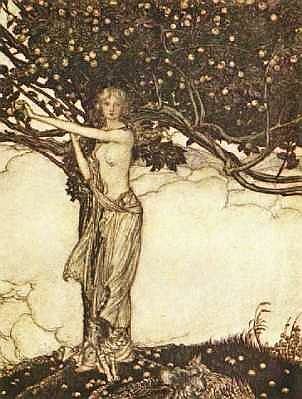 In traditional riddles and kennings, Saule is often referred to as the "golden apple." Other associations include: Fire, horses, zalciai (Lithuanian grass snakes) birds and trees; in particular, the Linden; Roses and daisies; White cow or white she-goat at dawn and a black one as She sets; Bees; Her sled and later, Her multi-wheeled chariot or wagon; Her golden boat; Burning solar wheels; "Saules's Medis" (the Sun's Tree) and, of course, the solar crosses, which dot the Lithuanian landscape. 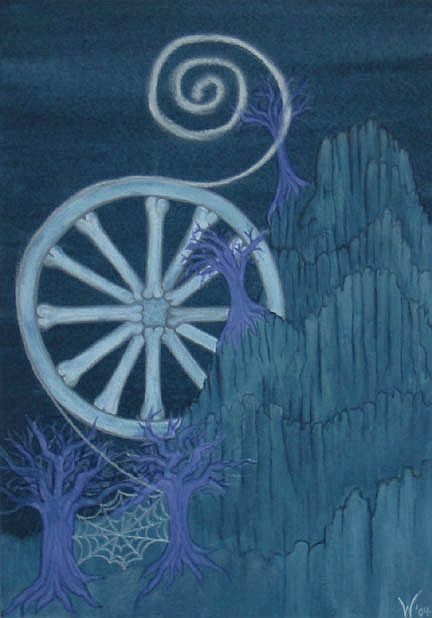 Saule is connected to the wheel. In Lithuanian, She is sometimes referred to as 'Ridolele', the rolling sun. In Latvian, there are solar songs with the refrain 'ligo', ('Ligot" means to sway), and 'rota' from 'rotat', to roll or hop. On summer solstice morning, Balts anxiously awaited the sunrise, in order not to miss even Her first blessed rays. Everyone wanted to see how the sun danced, how it ascended and then descended for a moment, and how it finally shone in various colours. In Latvian songs about such feasts we find the refrain: "The sun, dancing on the silver hill, has silver shoes on Her feet." Shepherds in Lithuania consider Saule to be their only guardian and have many devotional prayers dedicated to Her. Lithuanians address Her in the morning, as She sets and at the end of harvest with other songs and rites. All spheres of traditional women's work are under Her guardianship, as are earthly fecundity and healing; and it is She who plays the kankles (a traditional, ritual, stringed instrument). 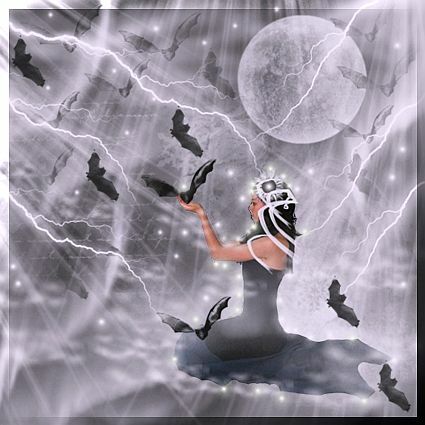 Saule has been described as the wife of Dievas, God of Shining Sky; of Perkunas, the God of Thunder, and Menulis, the Moon. Yet, in the end, She remains the independent and powerful matriarch of the Heavens and divine inspiration to all 'single' mothers. Beside the Balts, we find many other peoples with female solar deities; as in the Norse, Germanic, Japanese, Hindu, ancient Arab and numerous Native North American cultures. Where one does find a contemporary masculine sun, (Celts, Greeks and Romans) one also finds vestiges of Sun Goddesses in myth and place names. Prane Dunduliene, Lietuviu Liaudies Kosmologija. Vilnius: Mokslas, 1988. Dainius Sirutis, "The Lithuanian Sun Goddess Saule", Romuva/U.S.A, issue #4, 1991. Lietuvos Kulturos ir Meno Institutas, Senoves Baltu Simboliai. Vilnius: Academia, 1992. First published in Sacred Serpent: Journal of Baltic Tradition, Issue #2, 1994.